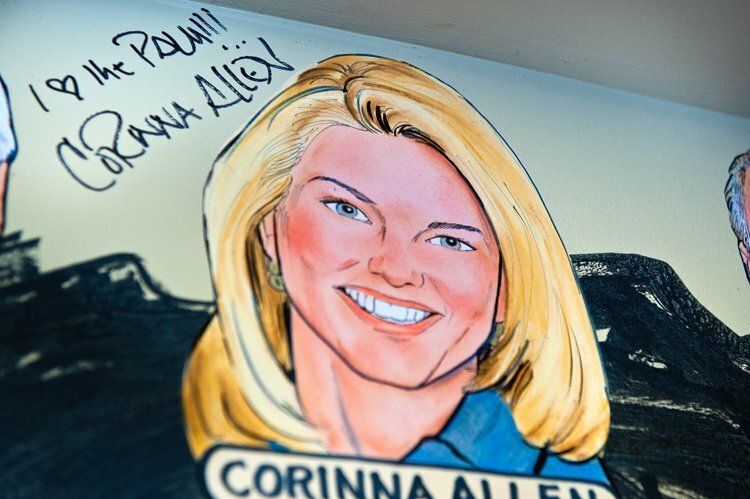 Corinna on the “Wall of Fame” at the Palm! The Palm restaurant in Buckhead has long been one of my favorite haunts, and their steaks have become my go to meal after any sporting event. So I was thrilled and honored when they asked to include my Portrait on their wall of fame! The hardest part of the whole process was waiting to see what the artist came up with! When the day for the reveal finally came, The Palm was kind enough to host a little party for me. They kept my portrait under wraps for most of the night. Finally, they brought out a step-ladder for me and I was allowed to rip down the paper that hid it. My good friend, photographer Scott Reeves was there with his camera and caught my reaction moments after seeing the portrait for the first time. It was such a great night, I used it as an opportunity to announce my engagement to David Cook. David did it in the form of a toast, confirming “the worst kept secret in Atlanta”. My girlfriend, Nicole Mitchell was one of the wonderful folks who turned out to help me celebrate the night. We’re both fan’s of clothing designer, Vanessa Vinci, who provided my electric blue dress for the night! This entry was posted on March 11, 2011 at 12:33 am and is filed under Around Atlanta, Uncategorized, Where's Corinna?. You can follow any responses to this entry through the RSS 2.0 feed. You can leave a response, or trackback from your own site. Congratulations, girl! Wondered what you been up to lately – miss you on Better Mornings! Now I know! You are so hot in that royal blue dress. And David is so handsome!